Five Score 10 Birthdays!! We Celebrate!!! Please Tell Us If You Know Someone Who Has Reached this Milestone!!! We will share with you just a little about two Shufflers who are celebrating the Anniversary of their birth on Wednesday, 2018 03 21, which as we all know is the first day of Spring!! What a Great Day to Celebrate your Birth!! The younger of the two is Mr. Gus Bondi, who will be precisely 5 score + 10 on Wednesday, March 21st, 2018. Gus is a Past President of the USA NSA, Gus is in the US NSA Hall of Fame; Gus is in the FSA HOF, Player Award; Gus is in the Central District HOF, Player Award, and finally Gus is in the ISA HOF!! From the above, we know that a) Gus has made a significant contribution to Shuffleboard, and b) we know that Gus has accumulated more than a few points (read won many games) in his time. I am now going to give you access to Gus’s Acceptance Speech on the occasion of his induction into the FSA Hall of Fame, Player Award. IT SPEAKS VOLUMES ABOUT GUS!!! FSA HOF Gus Bondi AND NOW, I add to the understanding of Gus, by giving you his Acceptance Speech on the occasion of his induction into the US NSA HOF. 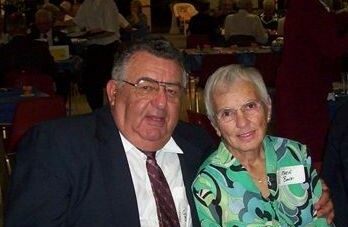 GUS BONDI DRAFT FOR POSTING US NSA HOF From All Shufflers, “Happy Birthday Gus! !” AND Thank You Marie for taking care of this “GUY”!! POST SCRIPT: Gus has just received the heart warming news that HE IS CANCER FREE!! Can anyone receive BETTER NEWS ON YOUR BIRTHDAY?? Stan McCormack. 2018 03 21. Our 2nd Shuffler Was Not on the World Stage So To Speak, but as you will see when you click on the first pdf file, he was “on stage” in Woodbrook Estates!! FL. His Name: Peter Van Buren. On 2018 03 21, Peter will celebrate his 98th Birthday!! 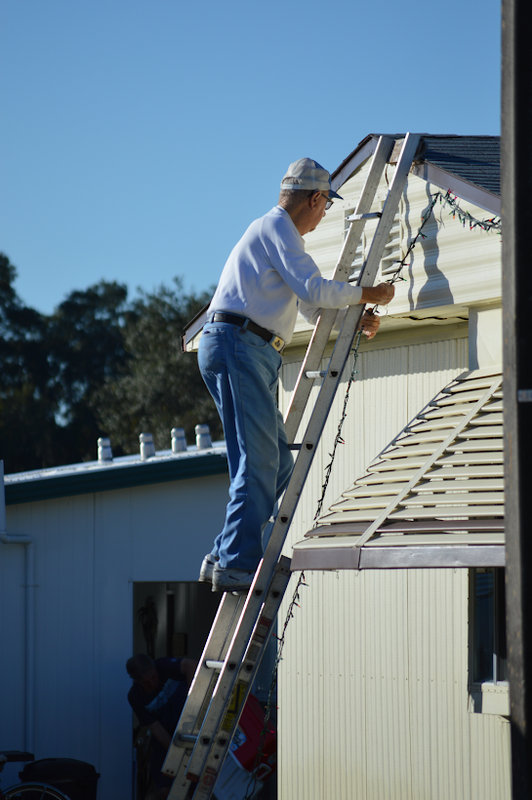 Gary Pipher Speaks: This picture of Peter on the ladder was his last Christmas in Woodbrook before he sold his house (just look at him up the ladder hanging his lights.). He always decorated his house with colored lights for the seasons, and at one time, he and Dr. Jack Hopps ( the Canadian inventor of the Pace Maker ), Peter’s best friend and neighbor for over 25 years, decorated the lamp posts and front gates to the Woodbrook Park. I am now going to give you access to an article I wrote in 2015. Peter VanBuren celebrated his 95th Birthday to Peter has now stopped coming to FL (as of last year) but Gary Pipher, who maintains contact with Peter, said this in an e-mail of March 20th, 2018: Yes Peter is still very alive. We spoke with him last week and he sounds just like Peter from years ago. His activities have been somewhat less than while in Woodbrook over the winter . He said he does a lot of reading and lots and lots of crossword puzzles and of course both these activities keep his mind sharp and alert. He still pushes a lawnmower and cuts grass during the summer and of course he shoveled snow many times this winter. Barb and I have planned to go down to Turkey Point and take him out for dinner . 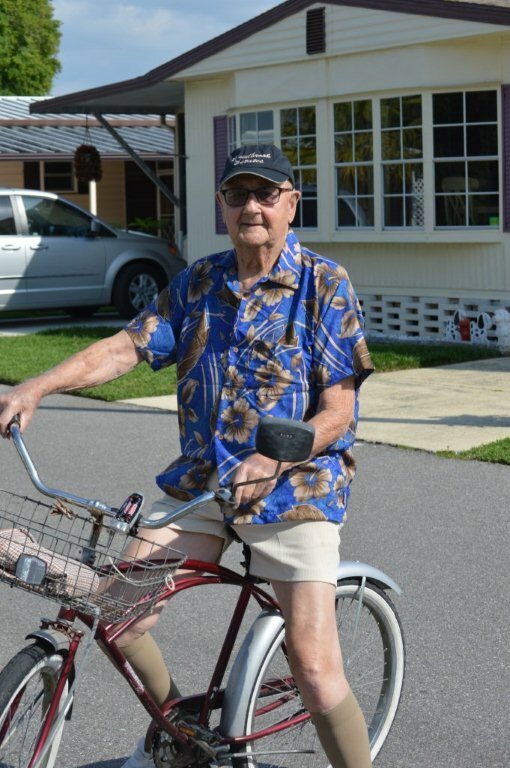 He misses Florida but is so grateful that he enjoyed over 45 years of winters there . He is a remarkable man. Before signing off, I would like to send Birthday Greetings to Peter from All Shufflers, but a special Greeting from his long time friend Wilma McLung of Woodbrook Estates.